The Republican leader in the Iowa Senate says legislators should make eliminating the state income tax a “big picture goal.” In the meantime, Bill Dix says lawmakers should cut taxes and cut state spending next year. “As a state, we need to challenge ourselves in how much it costs to run state government,” Dix says. Kansas lawmakers dramatically cut state income taxes in 2012 and 2013, but Dix says that experiment failed because officials in Kansas did not make deep enough cuts in that state’s budget. “We have to redouble our efforts to really reanalyze what our priorities are and how we use your money and what impact that has on the overall economy and growth,” Dix says. Seven U.S. states do not have an income tax and Dix says the economy in neighboring South Dakota is booming because there’s no income tax in South Dakota. “The other 11 Midwestern states have all seen a loss in the last decade of wealth, real wealth, in their states,” Dix says. 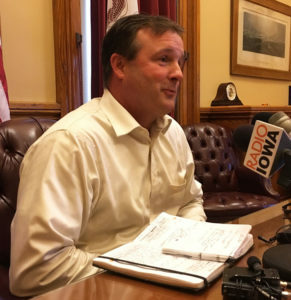 Dix, who is from Shell Rock, made his comments during a forum sponsored by the Iowa Chamber Alliance, a group that represents the state’s largest chambers of commerce. Critics of eliminating the state income tax altogether say Iowans will wind up paying more in other taxes. Texas residents do not pay an income tax, but face steep property taxes, for example. Washington state residents don’t have an income tax, but that state’s gas tax is highest in the country.